Everyone needs to change and evolve over time, but that doesn’t mean you need to go hog wild. 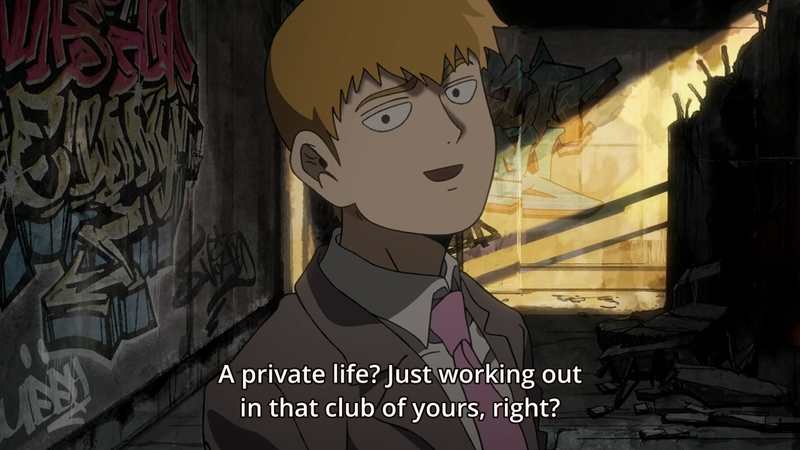 All Arataka has to do was, well, show a little consideration for Mob, but instead, he just keeps digging and digging and digging himself a deeper hole. What a mess. To set the stage, Mob is just taking it one step at a time. He hasn’t won Takane’s heart, but that doesn’t mean his time in the Body Improvement Club is a waste. He’s made friends, and he’s gotten a teensy bit stronger (in the physical department). That’s something to be proud of. Unfortunately, Arataka doesn’t respect these changes, and as a result, he shows that he doesn’t respect Mob at all. 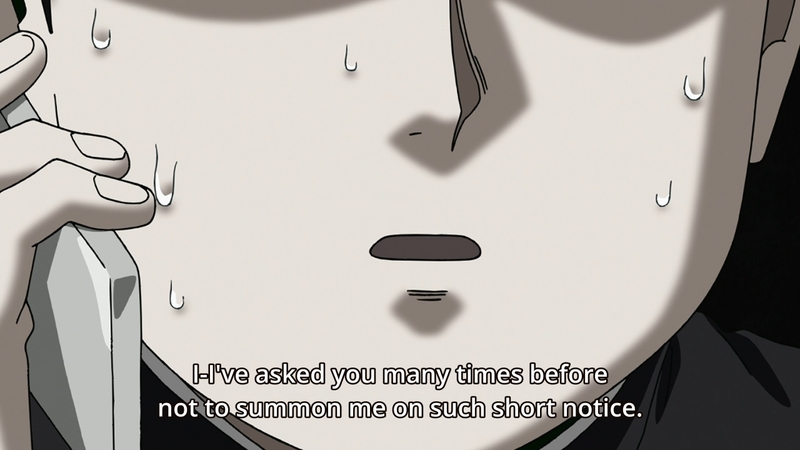 Even worse, he’s dismissive when Mob brings up his concerns. The kid is hanging out with his friends when his boss drags him out to yet another exorcism job. Well, Mob still goes to help his master despite his protests. As you can see, he actually respects Arataka; he doesn’t leave his “master” high and dry. All he wants is a bit of reciprocity. But when Mob reiterates that he can’t be called on a whim, Arataka mocks him instead. All the guy has to do is be a little more considerate, especially since he’s dealing with a kid. Why is this so hard? Well, it just goes back to that respect thing, doesn’t it? He doesn’t respect Mob, so he doesn’t respect the kid’s time. He doesn’t actually believe that his “disciple” actually has friends or a social life. For them to have worked together this long, that’s actually quite sad. So for now, the duo has decided to go their separate ways. Mob finally gets to do normal kid things with his friends like go sing at the karaoke bar. Is he having fun? Well, it’s all new to him, so he isn’t sure yet. Maybe he isn’t actually having fun, but at least he’s giving it a shot. At least he’s learning new things about himself and the world around him. If he hadn’t stood up to Arataka, then all of his personal growth will have been for naught. Having said that, at no point does it feel as though that their relationship is broken beyond belief. At no point does it feel as though they can’t just bury the hatchet and let bygones be bygones. It just takes Arataka being the bigger man. 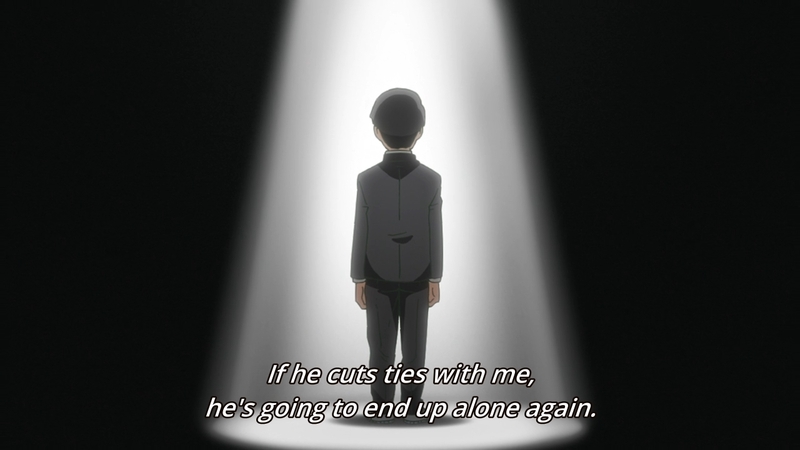 At first, he is strangely confident in his belief that Mob is lonely and miserable without him. Like someone who has just been dumped, he thinks that the kid will come crawling back to him. What an ego on the guy, huh? Again, why does he think so poorly of Mob? He doesn’t dislike the kid. He has shown in the past that he cares about Mob, so what gives? I guess at the end of the day, if something comes into conflict with his ego, his ego will win out. 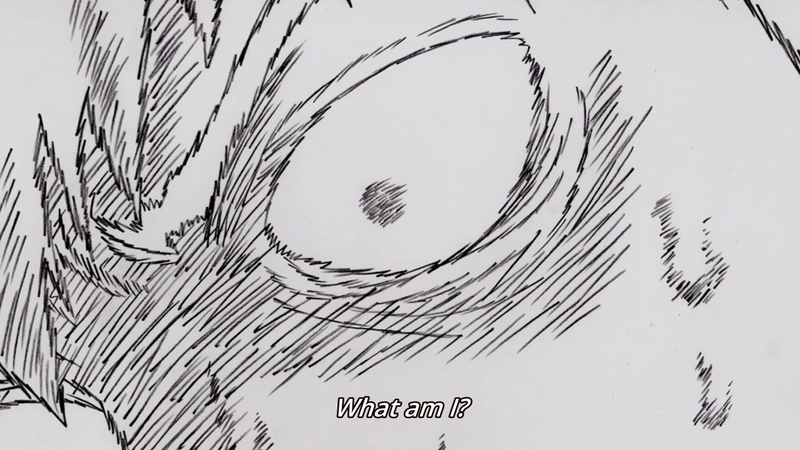 So instead of accepting the possibility that he is wrong about Mob, Arataka thinks poorly of Mob instead. 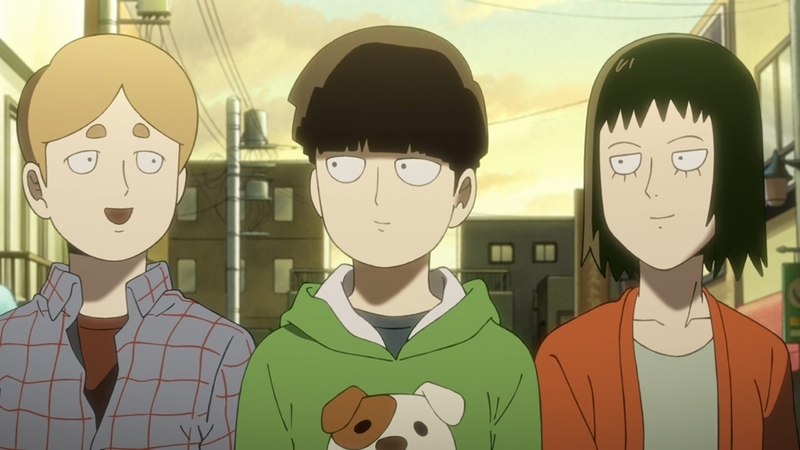 Eventually, he spots Mob hanging out with two of his friends. Seeing is believing, so he can’t deny the truth any longer. Does Arataka now swallow his pride and apologize to Mob? Oh, if only it is that easy. Most of us have a special talent for learning things the hard way, and Arataka is no different. After stewing in his negative feelings for a while, Arataka decides to work even harder. This just shows you how insecure he really is. 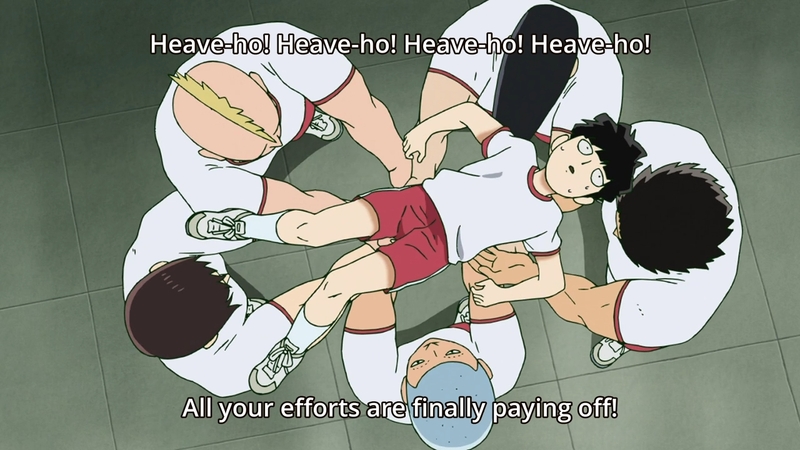 Arataka has been bossing a kid around to pump himself up, and instead of just giving Mob an inch in order to mend their relationship, he refuses to admit “defeat.” Friendships shouldn’t be about winners and losers, but that’s not how Arataka wants to play it. By god, he built this business on his own (not really), so he can do this without anyone’s help (probably not). To be fair, it’s not all scam work. Yeah, Arataka’s a snake oil salesman at his core, but we also get to see him cleaning up the city, teaching people how to spot fraudsters, listening to their concerns, so on and so forth. This is all admirable, but you can’t help but remind yourself of the fact that a grown man finds it too difficult to apologize to a kid. Is it really that hard? You would think that this is easier than all of the jobs that he’s taken on, huh? Especially considering how one of the them requires him to spend days and nights leveling up in an online game and spending real money in order to “exorcise” a player-killer. Well, this just shows you how a a person’s pride can trap them in a toxic mindset. He should take his lumps and be proud of Mob, but just wants to forge on ahead by himself in some futile attempt that he doesn’t need the kid. It’s supposed to be a mutual relationship, but Arataka’s insecurities get his way. Like a lot of people, he will need to hit rock bottom before he learns his lesson. So what do we see next? We see the guy get invited to a TV show about psychics. The idea here is that his popularity will skyrocket after this golden opportunity. What he doesn’t know, however, is that he’s walking into a trap. Kirin, that psychic who got knee’d by Arataka in the Mogami arc, wants revenge. He wants to humiliate and expose Arataka as a fraud. And the sad thing is that all of this could’ve been avoided if Arataka had just been a little more considerate to his one friend. 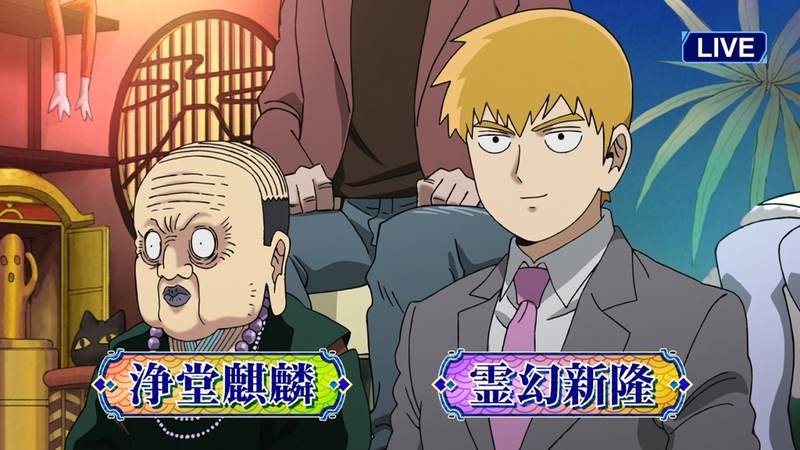 It’s interesting that some of us mentioned about whether the relationship between Reigen and Mob would change, and this arc seems to focus on it. 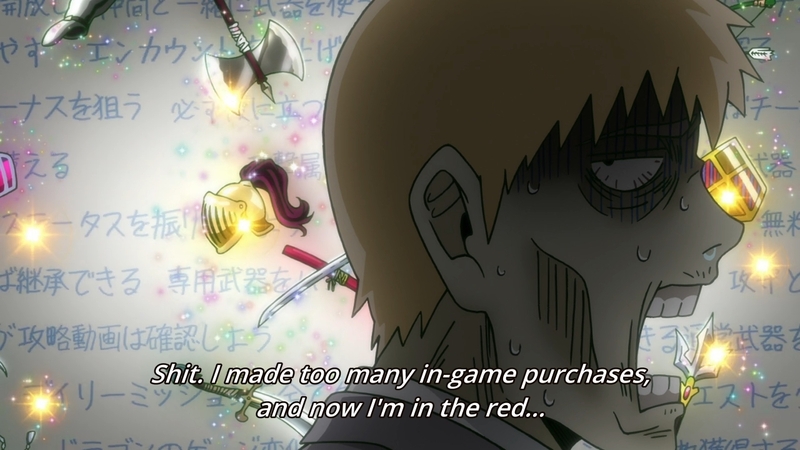 It’s also interesting that it focused on Reigen development, rather than Mob. Dororo and Mob Psycho are both top anime of this season, but I prefer Mob, because I feel there’s something very heartwarming at the core of the story. I don’t know if Dororo really has a core message to it other than that life is short and brutish, and how human selfishness knows no bounds. At the moment, anyways. It’s an interesting watch, but I’m certainly not inspired by it. “Inspired” is a very good word to describe Mob Psycho for me. 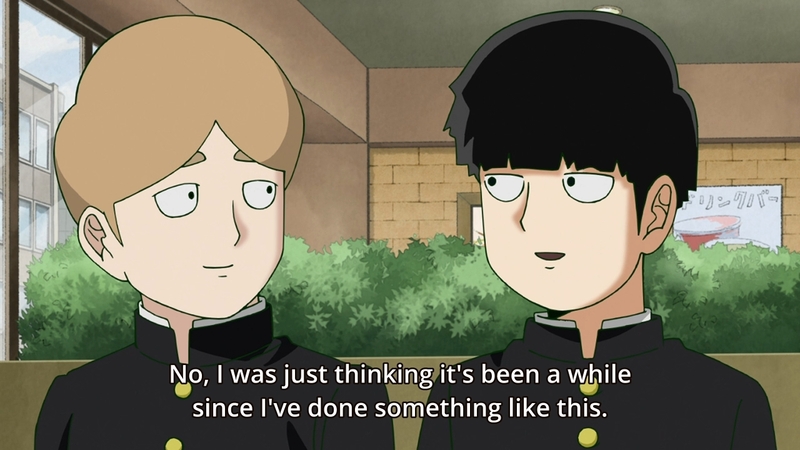 I am moved by Mob’s earnest effort in becoming a better human and it makes me think maybe I should adopt a similar attitude. 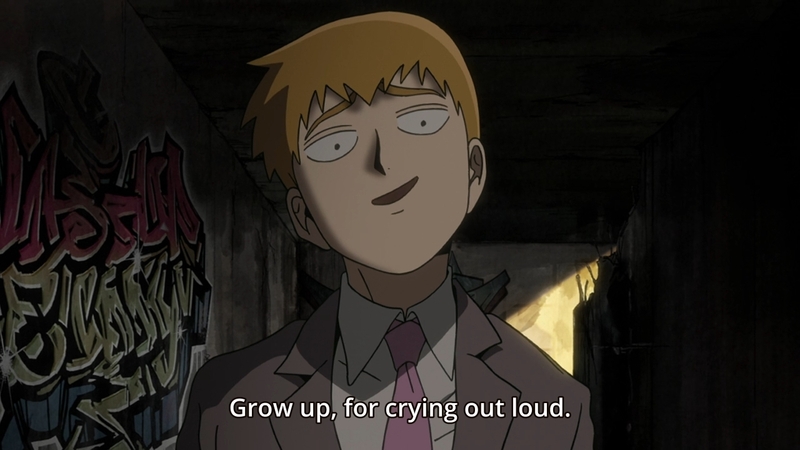 Reigen has always been a proud individual who tend to underestimate situations because he is sure he can deal with it. This is really apparent when he entered the evil esper organization’s HQ in season 1. 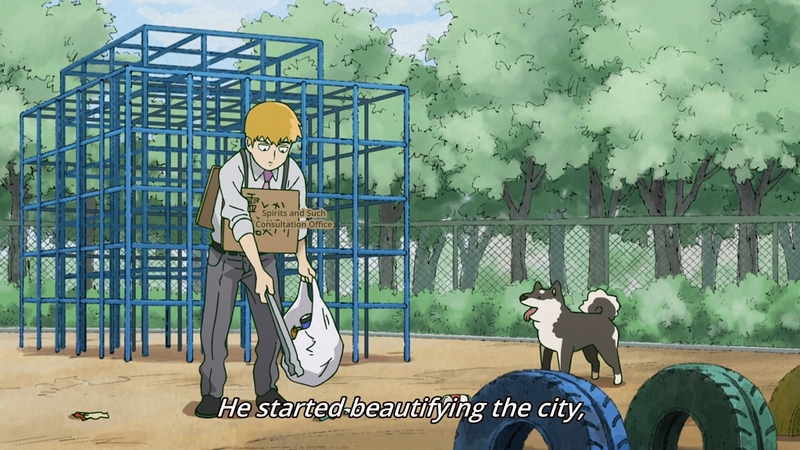 Just like ndqanhvn, I also find it interesting that this arc is about Reigen’s character development than Mob. In most shonen, it’s usually the other way. Previous PostPrevious Dororo Ep. 6: Why you gotta do this to me, man?